The Walkman was first introduced in Japan on July 1st, 1979, but did not hit shelves in the U.S. and other countries until 1980. Sony executives originally thought that the Walkman was an idiotic idea. They claimed that only a fool would buy a tape player that could not record. The Walkman was originally released as a prototype to Sony co-founder Akio Morita so that he could listen to opera music on long business flights. Morita hated the name "Walkman," but the device had already started to advertise under that name, and the company kept it. An early name suggestion for the Walkman was the Sony Disco Jogger, because of the (mutually exclusive) popularity of—you guessed it—disco and jogging in the '70s and '80s. 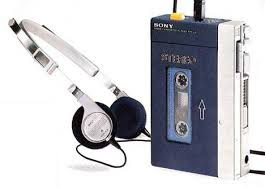 Sony only sold 3,000 devices during its first month, which led the company to believe the Walkman was a flop. The Walkman's starting price was around $200. Compare that to the first iPod, which sold for $400 to $500, depending on the number of gigabytes. The device's audience differed from other personal tape players because it was marketed to young people—commuters, joggers, college students—rather than journalists. Between 1987 and 1997, the number of people who walked for exercise in the U.S. went up by 30 percent, due in part to the popularity of the Walkman. The Walkman had two headphone jacks, so two people could listen to it at once. If you are scratching your head thinking, Why doesn't the iPod do that? then you're not the only one. On launch day, employees biked and Rollerbladed in front of the Sony building while wearing a Walkman to show just how portable and awesome it was. In 2005, PC World named the Walkman as one of the 50 Greatest Gadgets of the Past 50 Years. In 1986, the word "Walkman" was added to the Oxford English Dictionary. The first device to gain as much worldwide attention as the Walkman was the iPod in 2004—25 years after the first Walkman hit the market. One of the first Walkman commercials pictured a monkey listening to music. This monkey, a Japanese macaque named Choromatsu, was part of an animal acting troupe in Japan until he retired in 1990.